Sameer Verma will look to successfully defend his title as he takes on Ajay Jayaram in a blockbuster all-Indian clash at the Yonex Swiss Open 2019, a World Tour Super 300 tournament in Basel, Switzerland on Wednesday. 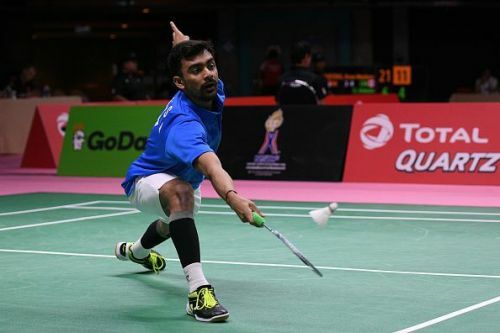 It was this tournament last year that gave a glimpse of Verma’s champion qualities when he rode on a giant-killing run to get the better of Kento Momota, Kantaphon Wangcharoen and Jan O Jorgensen on his way to the biggest title of his career. 12 months later, the 24-year-old will hope to bank on the memories of those exploits to make a statement once again in the Swiss city. For Sameer, a good run here will be a huge boost after a tight loss to eventual runner-up Viktor Axelsen in the first round of the All England Open last week, and ahead of the India Open at the end of this month. The eighth seed has drawn his 31-year-old compatriot Jayaram after the World No. 55 was promoted to the main draw from qualifying. While the BWF World Tour Finals semi-finalist is the only Indian to be seeded, former Singapore Open champion B Sai Praneeth has a tricky encounter with the Commonwealth Games bronze medallist Rajiv Ouseph in his opener. 2014 Commonwealth Games gold medallist Parupalli Kashyap has the 87th ranked Swedish qualifier Felix Burestedt in his first round. A win could see him lock horns with the sixth-seeded Tommy Sugiarto. 2018 SaarLorLux Open winner Subhankar Dey is the fifth Indian in the men’s singles draw and he has the French qualifier Lucas Claerbout in the first round. Overcoming him would set him up for a tough second-round clash with the fifth seed and 2018 Asian Games gold medallist Jonatan Christie of Indonesia. The draw is headed by the World No. 2 Shi Yuqi while the second seed is the Olympic champion Chen Long. In women’s singles, former two-time champion Saina Nehwal made a last-minute withdrawal after reaching the quarter-finals of the All England Open last week where she had to battle diarrhea. In her absence, Riya Mookerjee, Vaishnavi Reddy Jakka and Vrushali Gummadi will be the Indian youngsters hoping to get some much-needed match play. In men’s doubles, Sumeeth Reddy and Manu Attri have the Danish pair of David Daugaard and Frederik Sogaard in the first round. The Commonwealth Games women’s doubles bronze medallists Sikki and Ashwini Ponnappa will take on the unseeded pair of Anastasiia Akchurina and Olga Morozova in their opener. In mixed doubles, Sikki and Pranaav Jerry Chopra have the German duo of Jones Ralfy Jansen and Kilasu Ostermeyer in Round 1.